Verizon in its press release notes customers are responsible for tax fees on the $9.99 Apple Music subscription, though that extra cost is apparently built in as advertised unlimited plan pricing remain unchanged. America's largest cellular carrier by subscribers first partnered with Apple in 2018 to give six months of free Apple Music to subscribers of each of its three unlimited plans. Angie Klein, VP of marketing at Verizon, in a statement on Tuesday suggested today's Apple Music promotion has been in the works for some time. 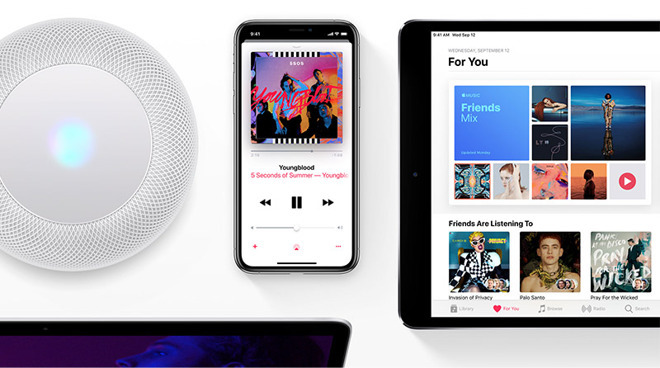 "When we introduced six months free of Apple Music to Verizon Unlimited subscribers, we said it was just the beginning of a great collaboration between Verizon and Apple to bring music streaming to our loyal customers," Klein said. "Our customers loved the offer, so we're ramping up the value of our Beyond Unlimited and Above Unlimited plans by including Apple Music so you can stream more of the music you love on the network you deserve." The article is a bit confusing. Does the Apple Music subscription continue after 6 months? We just upgraded our plan to the top level unlimited plan. That came with 6 months of Apple Music too. Yes it does, I have the Basic Unlimited and we won't be getting it. It’s good to see the best services collaborating together. The last thing companies want is to allow customers to compare apples to apples, TV manufacturers do the same thing by changing the model numbers depending on where their product is sold. In the case of wireless providers are using bundling or perks to muddle the costs, T-mobile gives “free” Netflix, and Verizon “free” music. The reality is US consumers pays sky high prices for wireless services compared to the rest of the world. Rather than lower prices, which companies hate doing, they pretend they’re doing you a favor giving you perks. By the way, Verizon would love for people to be streaming music rather than watch movies on their “premium” plans. Want to bet Apple Music actually saves them money? Apple Music I pay to Apple. In order to gain this access as part of a plan I have to upgrade to either BeyondUnlimited or AboveUnlimited. beyondunlimited [their wording not mine]: $90/mo per line. In short, who gives a frack? I already pay $9.99 for Apple Music. I could careless about their effing tiered 4G LTE between plans--thanks FCC for effing us on Net Neutrality. I had GoUnlimited, originally. Data speeds were spotty, at best, making Sprint seem like better service. For $10 more per month, BeyondUnlimited is well worth the extra money. I regularly see speeds over 100 Mbps in my area. As for Net Neutrality, tiered data speeds isn’t part of that. Broadband companies have been doing it for years. Now, I need to figure out how to get the included Apple Music, and stop paying for the family plan, without losing everything we already have with Apple Music. We definitely do pay sky high prices compared to other places in the world. One thing you do need to remember is the USA is a very large country. Wireless providers have to spend a ton more on infrastructure, spectrum licenses, maintaining the network, etc. If you compare countries in Europe for example, they are tiny compared to the USA. Wireless providers in say France spend a ton less compared to here. With such high costs for companies like Verizon, AT&T, we consumers are getting those costs passed onto us.